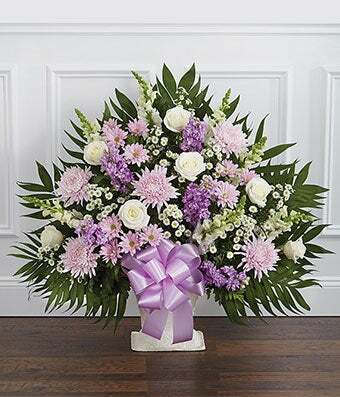 The purple and white flower sympathy floor basket is a wonderful gift to show your care. Created with white roses, snapdragons, mums and carnations. Floor baskets are typically sent to a family member, friend or co-worker. Medium arrangement (shown) measures approximately 32"H x 36"L.